A handful of the new luxury crossovers are being recalled. 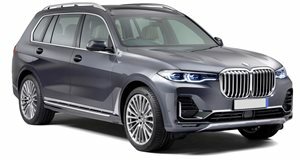 It's only been a few months since BMW revealed the X7, and just weeks since the new flagship SUV started arriving in dealers. So we were a little surprised to see it pop up on the list of recalls issued by the National Highway Traffic Safety Administration. But we suppose we can chalk this one up to teething issues. The problem for which the new X7 is being called in to address comes down to a seat bolt that may not have been properly tightened during the assembly process. But the issue is restricted to certain vehicles. Namely, those equipped with the Business Lounge Seat (or Captain's Chair) option, which replaces the second-row bench with individually adjustable buckets seats. With deliveries having only begun earlier in March and relatively few evidently having been equipped with the optional seats, only 31 vehicles are being recalled in the United States under this campaign, including both powertrain variants: the X7 xDrive40i (with the 3.0-liter turbo six rated at 335 horsepower and 330 lb-ft of torque) and the xDrive 50i version (with a 4.4-liter twin-turbo V8 good for 456 hp and 479 lb-ft). Both drive all four wheels through an eight-speed automatic transmission. Sitting alongside the 7 Series sedan and 8 Series coupe and convertible at the top of its lineup, the X7 is BMW's new flagship crossover, aimed squarely at the Mercedes-Benz GLS and (to a lesser extent) at full-size truck-based luxury SUVs like the Cadillac Escalade, Lincoln Navigator, Lexus LX, and Infiniti QX80. With the X7 just having begun to arrive in showrooms, those 31 examples being recalled are still said to be on dealer lots. So replacing the problematic bolts should be a simple matter for dealers who'd otherwise have to wait for customers to bring in their recalled vehicles piecemeal.